How I Took my own Advice and Failed! Every week in my online community I share mindful tips, usually a short quick tip on mindful living in a busy society. Mindful living is something I’m passionate about, I live it myself and I share it with others. Today I had a perfect opportunity to actually practice what I preach when I felt the familiar twang of anxiety hit me. I had a trip to town planned and a list of chores to complete while I was there and depending on my mood, the planets, my blood sugars, the weather, any number of factors can actually contribute to how this goes. Today, however, was definitely an anxiety inducing one. When I felt my heart constrict and my breath catch in my chest at the thought of what I was facing before I’d even got dressed I knew I had to prepare. A hit of essential oils was, well, essential. A quick rub and a warm up of peppermint and sweet orange was just what I needed. Like a super double espresso caffeine shot straight to my brain. It felt so good I loaded up my aromatherapy necklace for good measure. It felt like I was mentally preparing for battle, and if you’ve ever experienced anxiety you’ll know what I mean, and believe me, sometimes it totally is like preparing to run the gauntlet of attacking energies. So, smelling like a fruit polo I was ready. The mindful exercise I had chosen was the colour exercise. You choose a colour and as you go about your business you focus your attention, not on your anxiety and fears but on picking out your chosen colour in the world around you. This exercise keeps you focused and in the moment. It distracts your brain from returning to fear and causing the physical symptoms of anxiety to manifest and is awesome because no one needs to know what you’re doing. I was really enjoying it, noticing things around me that I’d never noticed before, even though I must have passed them a thousand times before. Like, who knew there was a big red post box right outside of BurgerKing?!? Flashes of red from people’s coats, handbags, trainers, shop sales signs, window displays, awnings, chairs, shopping baskets stacked up outside the convenience store (never seen them before), were all around me! By the time I walked through the high street and entered the shopping centre all I could see was a sea of red, everywhere! My vision started to narrow, my breath was coming quick and shallow, I felt disorientated and like my brain was about to implode, oh my GOD I’m about to freak out at the bottom of escalators right outside Debenhams! “No no no no no. Do not let this happen”. BREATHE “Breathe Kerry breathe, that’s it, slow deep breaths, in and out, in and out. You’re not going to pass out, you’re not going to die”. “OMG I’m going to DIE”! CALM “Calm Kerry calm. Slow and steady back to reality, you’ve got this”. Quite simply, I forgot to breathe. I forgot my focused, calm inducing breath! THE most important part of any mindful practice. THE thing I bang on about most. The part that oxygenates your cells. The part the keeps your heart rate down. The part that brings your focus back to NOW. Well, that was embarrassing. I’ll just keep quiet about that then. No, I want to share it. It’s a perfect example of how you should never become complacent in your practice. I have my anxiety well under control and go months between attacks but today showed me just how important it is to continue with the exercises even when you don’t feel you need to. Even when things are going tip top for you. That is the time it’s super important to work it, so it is there when you need it, a tool at your disposal to get you through those tricky times. It’s called mindful practice for that exact reason. Practice it daily so it becomes as natural as walking, and breathing. Practice it when it’s fun. Practice it when you’re happy. Practice it when you’re full of vitality and joy. Because it will then be there when you need it, second nature. No freak outs in the shopping centre. I have learnt my lesson and will definitely be upping my game, taking my own advice and resetting my mindful practice. 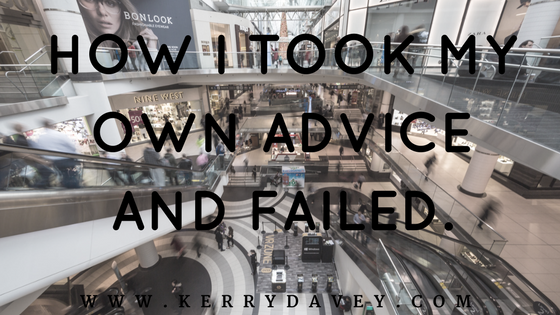 And I hope that by sharing my experience I can save you the embarrassment of a complete shopping centre meltdown.